In CASA, these corrections can derived by gencal for the JVLA. 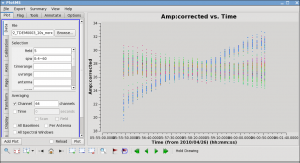 The parameter caltype='antpos' will us antenna position offset values and create a calibration table for the delay changes that this correction involves. If the 'antenna' parameter is not specified, gencal will query the EVLA webpages for the offsets (EVLA/VLA Baseline Corrections page). 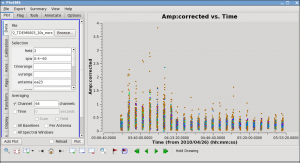 Please note: if you are reducing VLA data taken before March 1, 2010, you need to set caltype='antposvla'. 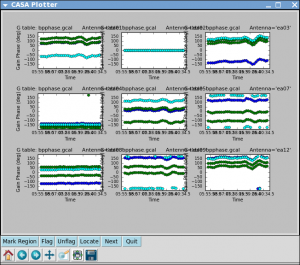 For the VLA before the conversion to the EVLA or JVLA, the automated lookup will not work and one has to specify the the antenna positions explicitly. The calibration task opacity parameters can now take either the variable directly opacity = myTau or the list of opacities like opacity = [0.0392, 0.0390] or, if a single value is good enough to correct for all spectral windows, one can simple use opacity = 0.039. Note: In CASA 3.4 flagdata spits out a warning and suggests to use 'tflagdata'. 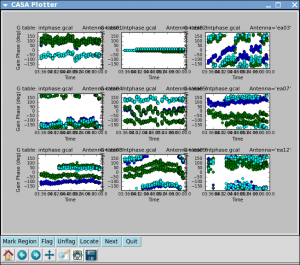 For the purpose of this tutorial, we continue to use the current 'flagdata'. In CASA 3.5, 'tflagdata' will replace 'flagdata' and the tutorial will switch to the new syntax. Scaling spw 0's model image to I = 1.77625 Jy for visibility prediction. 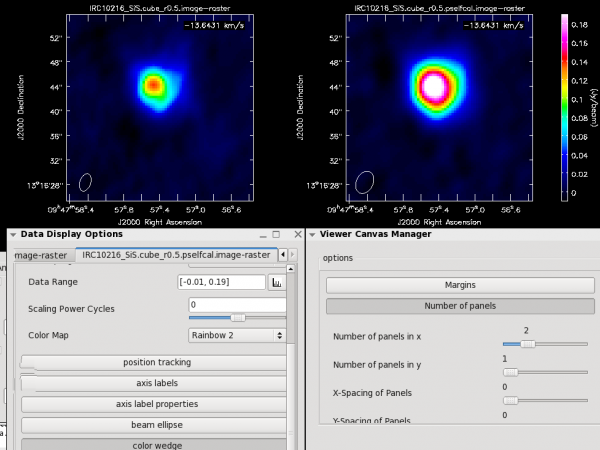 Scaling spw 1's model image to I = 1.7794 Jy for visibility prediction. 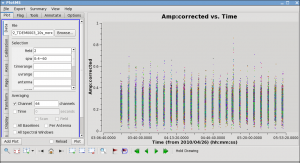 Let's take care of the delay calibration first. The delay is the slope of phase across frequency. Form the plot we saw that it was rather modest and the bandpass calibration will certainly take care of it. Nevertheless, it might be good to derive a delay calibration first and the calculate the bandpass. 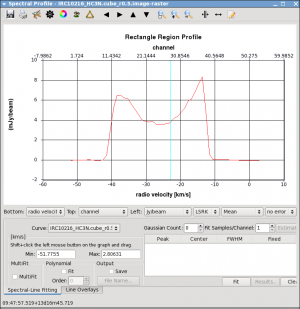 The delay calibration is an antenna based calibration solution and it can be derived in gaincal with caltype='K' . 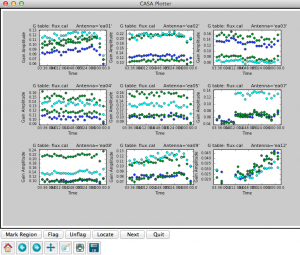 This call also exemplifies how the CASA calibration table system works. Calibration tables are incremental. So we supply the previous 'antpos.cal' table as input to gaincal. The following calibration step will require gaintable=['antpos.cal','delay.cal'] and so on. Now we proceed to the actual bandpass calibration: Since the bandpass calibrator is quite strong we do the phase-only solution on the integration time of 10 seconds (solint='int'). Note the scale for the phasesm, they are very small since the delays were already taken out in a previous setp. UV-plot of the spectral line signal in both spw for IRC+10216. 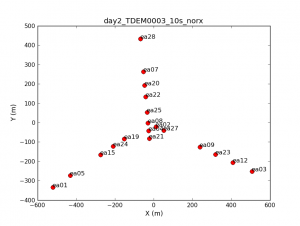 Now we can make a vector averaged uv-plot of the calibrated target spectral line data. 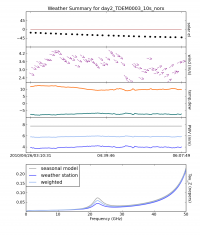 It is important to note that you will only see signal in such a plot if (1) the data are well calibrated, and (2) there is significant signal near the phase center of the observations, or if the line emission (or absorption) is weak but extended. 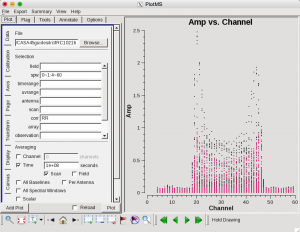 If this isn't true for your data, you won't be able to see the line signal in such a plot and will need to make an initial (dirty or lightly cleaned) line+continuum cube to determine the line-free channels. 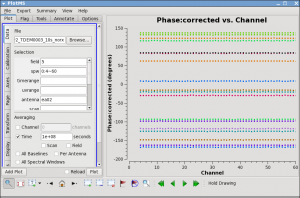 Generally, this is the recommended course for finding the line-free channels more precisely than is being done here due to time constraints, as weak line signal would not be obvious in this plot. In the Display tab, change the Unflagged Points Symbol to Custom and Style of 3. You should see the "horned profile" typical of a rotation shell. From this plot, you can guess that strong line emission is restricted to channels 18 to 47 (zoom in if necessary to see exactly what the channel numbers are). In the Data tab, under Averaging, you can also click on "All Baselines" to average all baselines, but this is a little harder to see. Now we want to use the line free channels to create a model of the continuum emission that can be subtracted to form a line-only dataset. 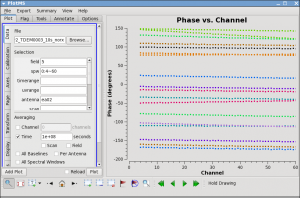 We want to refrain from going to close to the edges of the band -- these channels are typically noisy, and we don't want to get too close to the line channels because we could only see strong line emission in the vector averaged uv-plot. The "want_cont=T" will produce two new datasets, IRC10216.contsub is the continuum subtracted line data, and IRC10216.cont is the continuum estimate (note however, that it is still a multi-channel dataset). 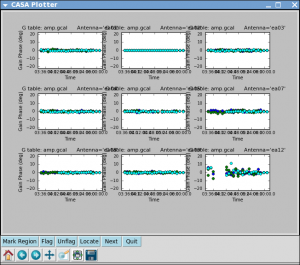 The current incarnation of the EVLA does not support Doppler tracking. 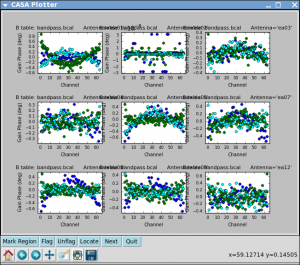 Doppler setting is possible which will calculate the sky frequency based on a velocity of the source at the start of an observation. The sky frequency is then fixed throughout that track. 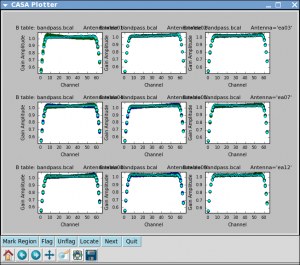 Typically, a fixed frequency is better for the calibration of interferometric data. The downside, however, is that ta spectral line may shift over one or more channels during an observation. clean takes care of such a shift when regridding the visibilities in velocity space (default is LSRK) to form an image. 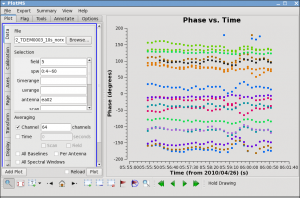 Sometimes, in particular when adding together different observing tracks, it may be advisable to do the regrid all data sets to the same velocity grid, combine all data to a single file, then Fourier transform and deconvolve. The tasks cvel, concat, and clean serve this purpose respectively. The following run of cvel shows an example on how the parameters of cvel may be set. Note that this step is not necessary for the processing further down in this tutorial. You may skip it if you wish. 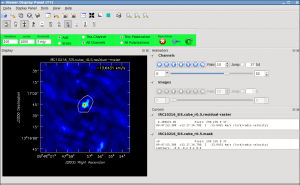 After the cvel step, the data can then be combined with other observations via concat and imaged in clean with mode='channel' to conserve that velocity system and grid. Channel 32 shown for the HC3N cube shown in the interactive viewer with the white contour showing the mask contour drawn with the polygon tool. 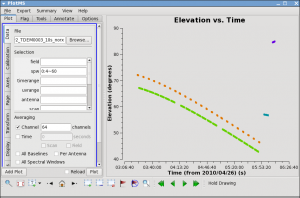 imagermode = csclean will invoke the Cotton-Schwab cleaning algorithm and the data will be regridded into a new output velocity frame, correcting for Doppler shifts of the line during the run (EVLA data for each track is always topocentric at a fixed sky frequency). The iterations are chosen as a high value to allow many clean cycles when needed. Typically, however, the threshold will kick in earlier and stop the cleaning process. 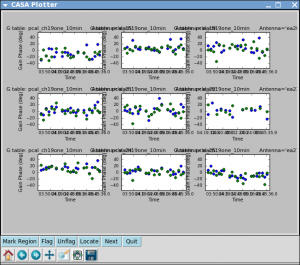 It will take a little while to grid the data, but the viewer will open when it's ready to start an interactive clean. 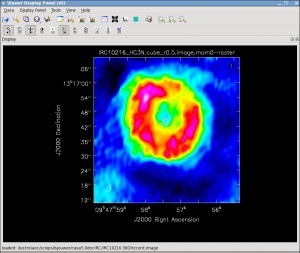 Use the "tape deck" at the bottom of the Viewer display GUI to step through to the channel with the most extended (in angular size) emission, select "all channels" for the clean mask, select the polygon tool (the 'R' with the wobbly line around it) and make a single mask that applies to all channels (see example in thumbnail). Once you make the polygon region, you need to double click inside it to save the mask region -- if you see the polygon turn white you will know you succeeded. Note, that if you had the time and patience you could make a clean mask for each channel, and this would create a slightly better result. After making the mask you should check that the emission in all the other channels fits within the mask you made using the "tape deck" to move back and forth. If you need to include more area in the mask, you can chose the "erase" toggle at the top, and then encircle your existing mask with a polygon and double click inside. Then go back to "add" toggle at top and make a new mask. Alternatively, you can erase a part of the mask, or you can add to the existing mask by drawing new polygons. Feel free to experiment with this a bit. To continue with clean use the "Next action" buttons in the green area on the Viewer Display GUI: The red X will stop clean where you are, the blue arrow will stop the interactive part of clean, but continue to clean non-interactively until reaching the stopping niter (note that this is "iterations" x "cycles") or threshold (whichever comes first), and the green arrow will clean until it reaches the "iterations" parameter on the left side of the green area. When the interactive viewer comes back use the tape deck to recheck that your mask encompasses what you think is real emission. The middle mouse button by default controls the image stretch. Note that for this example, threshold has been set to threshold = '3mJy' to protect you from cleaning too deeply. With a careful clean mask you can clean to close to the thermal noise limit (note here I mean the actual observed rms noise limit and not the theoretical one you calculated for the proposal, as flagging, weather, etc. can affect what you actually get). 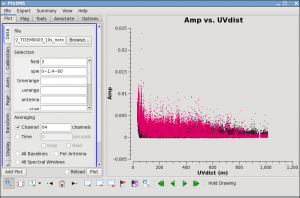 It is ALWAYS best to clean each channel in a cube to a specific threshold than to stop by simply using the niter parameter, which can leave each channel cleaned to different levels. There are many ways to determine a suitable threshold. One way is to make a dirty image (niter = 0), open the cube using the viewer, go to a line free channel, select the box region tool, make a box near the field center about the size of your source, and double click inside. The rms noise of that channel will appear in the terminal window from which the viewer was launched. 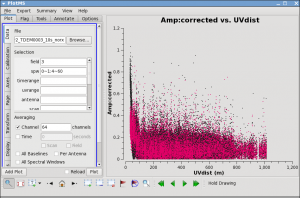 Try a few different boxes, average the results and this is a good estimate of the rms per channel assuming your data are not dynamic range limited (i.e. 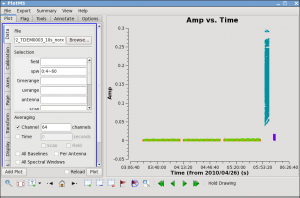 noise can be higher in channels with strong signal). This is the absolute minimum for threshold. With no mask you probably shouldn't clean deeper than 3x this rms. Channel 43 shown for the SiS cube in the interactive viewer with the white contour showing the mask contour drawn with the polygon tool. Keep cleaning, by using the green Next Action arrow until the residual displayed in the viewer looks "noise like". To speed things up, you might change the iteration parameter in the viewer to something like 300. This parameter can also be set in the task command. 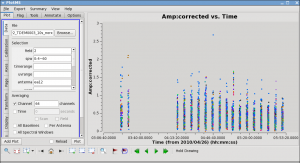 You will notice that in this particular case, there are residuals that cannot be cleaned -- these are due to the extended resolved out structure on size scales larger than the array is sensitive to (the "Largest Angular Scale" or LAS that the array is sensitive to can be calculated from the shortest baseline length), and potential residual phase and amplitude calibration errors. We will explore this in a few sections with self-calibration. Repeat the process for the SiS line using the call below, note that the emission for this line is less extended than the HC3N -- this has to do with the different excitation requirements of the two different lines. The SiS is excited closer to the central star than the HC3N. 'usescratch=True' prepares the data for selfcal below. You can look at both cubes using the viewer, and the tape deck to play the cube as a "movie". Below the use of mode='mfs' will make a single multi-frequency synthesis image out of the specified spw/channels. Again you should make an interactive clean mask. Since no threshold is set, you will need to stop cleaning when the residual looks noise like using the red x "Next Action" button (it will be done when the viewer comes back the second time). 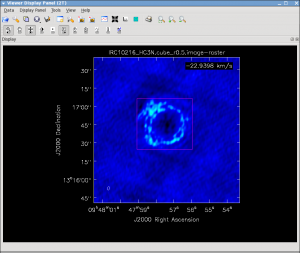 The continuum for IRC10216 is very weak but interesting -- it is essentially tracing the photosphere of the AGB star. The continuum data set produced with wantcont=True in uvcontsub2 is the model fit. To image the continuum itself, use the line-free channels. Then use the Viewer tape deck to see which channels have significant line emission. For HC3N, the line channel range in the cube is 16 to 45, and it is the same for SiS. HC3N moment 0 map with white continuum contours superposed. SiS moment 0 map with white continuum contours superposed. Then use the tape deck to go to a line free channel, select the box region tool and make a box. When you double click in the box, the image statistics for the channel you are on will print to the terminal. Move the box around a bit to see what the variation in rms noise is. You should get something like 2 mJy. Note that the rms is much worse in channels with strong emission because of the low dynamic range of these data. If you want the box tool to go away (i.e. if you want to make a new one), hit the escape key. Now let's make the moment 0 and moment 1 maps. 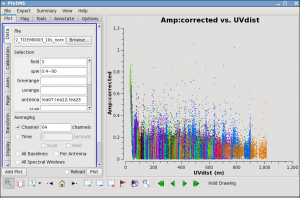 For moment zero, it's best to limit the calculation to image channels with significant signal in them, but not to apply a flux cutoff, as this will bias the derived integrated intensities upward. 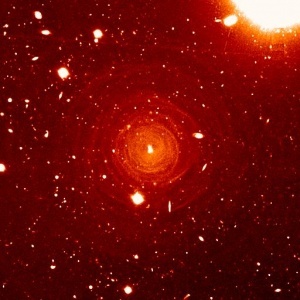 The VLT V-band image from Leão et al. 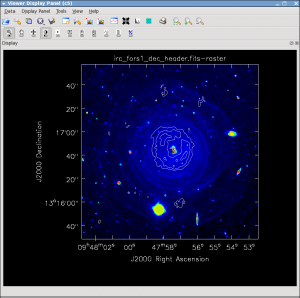 (2006, A&A, 455,187) showing dust rings, overlaid with white HC3N moment 0 contours and black 36 GHz continuum contours. 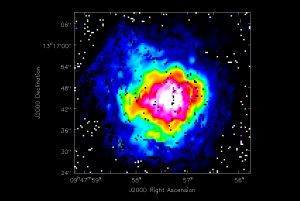 For fun you can download the VLT V-band image at http://casa.nrao.edu/Data/EVLA/IRC10216/irc_fors1_dec_header.fits kindly provided by Izan Leão and overlay the moment images and 36 GHz continuum. More information about the dust properties can be found in the Leão et al. (2006) paper http://adsabs.harvard.edu/abs/2006A%26A...455..187L. The creation of position velocity cuts from the viewer is currently being developed and hopefully available soon in CASA. If you are interested in a work-around, you may have a look at the pV casaguide. Masking the data cube to extract the emission is described here. Frequently, one would like to fit Gaussians or polynomials to the spectral line in the data cube. This can be done with CASA's specfit task. specfit can fit those functions to an average spectrum define by some bounding box, or, alternatively, for each pixel. In the following, we will do both. The viewer showing the cube at plane 34. The green box marks the region that is averaged for the spectral profile. Spectral profile of the HC3N line within the green rectangle. First, we want to inspect the spectrum. 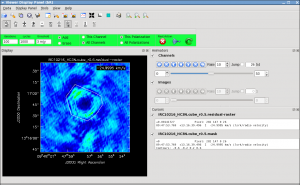 Load the image into the viewer (here: the HC3N image cube), select "spectral profile" from the Tools menu and open a region with the mouse button that is assigned to the rectangular "R" region in the tool bar. Best to do this at a plane that shows the entire extent of the source. The average spectrum will be displayed in a separate panel. To fit this profile in specfit, we need a region file outlining the 2-D region that is averaged (the green box in the viewer screenshot). In the following we use the new CASA region format (CASA 3.3 and higher) that is described here. Following the guidelines on that page, we create a file named specfit.crtf that describes a box with its [[x1,y1],[x2,y2]] corners in J2000 RA DEC coordinates. 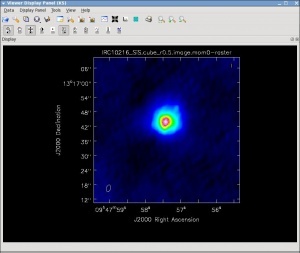 Output image of specfit of the amplitude of the first Gaussian component. 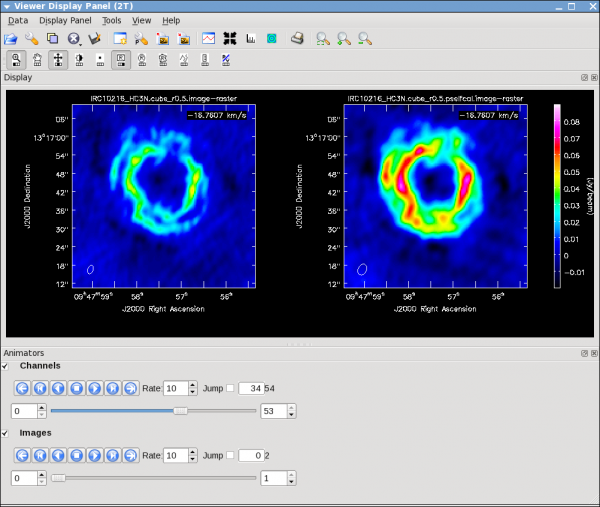 In this example, specfit will produce three images per Gaussian, images that map the best fit values of the Gauss peaks (amplitudes), velocity centers, and full widths at half maximum. 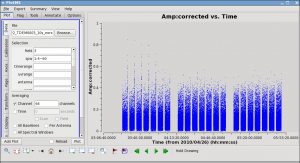 For the first Gaussian, the image to the right displays the amplitude image fit.amp.image_0. We choose to do the self cal on the spw=1 SiS line data because it has the strongest emission in a single channel and is a bit more compact than the HC3N data. We will run gaincal specifying the channel in the uv-data that has the brightest peak in the image (use the viewer to figure out which channel this is for spw=1), note down what the peak flux is. Since we started the image with a channel range we need to account for the fact that the image channel numbers do not map exactly to the uv-data channel numbers (they are off by 5 so that channel 13 in the image is roughly channel 19 in the uv-data). Plot to estimate the time on source. This analysis suggests that the rms noise on one baseline, for one 10 second integration is only about 500 mJy. In contrast, the peak flux density in the strongest SiS channel is only about 200 mJy (you can check using the viewer). Since the emission is fairly compact, most baselines will see about this peak flux; this is why we choose the more compact of the two possible lines. Thus, a 10 second solution interval is not enough to get a SNR of at least 3 on a 200 mJy peak. We need to use a solint large enough so that the rms noise is not worse than about 1/3 of 200 mJy. Thus, a solint of 10 minutes is about the shortest we can use and be reasonably confident of the solutions. Now we run gaincal with the solint we have determined. Note that because our desired solint is more than the scan time, we need to include combine='scan'. Phase-only self-calibration solutions with 10 minute solint. 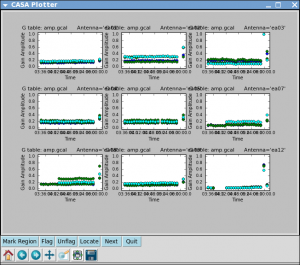 For some antennas you can see clear global trends away from zero: ea08, ea21, and ea24 are examples, and you can also see some smaller variations with time. Now let's explore whether applying this solution actually improves matters. 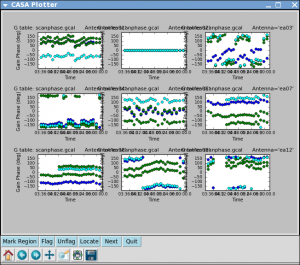 To do this we need to run applycal to apply the solutions to the line dataset, both spw. We need to use spwmap to tell it that the solutions derived for spw=1 should be applied to both spw=0 and spw=1. Again it's important to set calwt=F here. Note: in this example we ran the self-cal steps on the full uv continuum subtracted spectral line data set. For a more complex iterative self-calibration proceedure, you may find it easier to split off the channel/spw you want to experiment on with split, and then do all the imaging (clean) and gaincal steps with it. 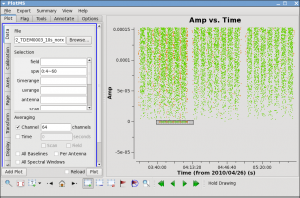 The gaincal tables created on the single channel can still be applied with applycal to the multi-channel/spw dataset. If you do this though, keep in mind that once split, the single-channel data will have its spw id reset to 0 (you can check with listobs), no matter what spw it came from. Thus in order to applycal with it you would need spwmap=[[0,0]]. To save time we can use the clean mask we made before and run in a non-interactive mode. You can use a mask over again as long as the number of channels in the clean call haven't changed. You can change cell or imsize and it will still do the right thing. Now you can redo the moment images if you like with the improved cubes (be sure to change the output file). names. This page was last modified on 6 December 2012, at 22:34.